Control Solutions LLC is an industry leader in motion control solutions. We provide a complete suite of engineering and design services, as well as quality manufacturing. We provide products and services to several vertical markets including health care, commercial and military. Control Solutions LLC understands the need for continuous improvement. Our goal is to achieve operational excellence in all aspects of procurement, manufacturing, supply, and customer order fulfillment. We do this through the use of new technologies, a dedicated and talented workforce, and a commitment to continuous improvement. We are pleased to provide the following information about how our Quality Systems operate, and how we insure our products meet our customers’ needs. OUR QUALITY POLICY: "ACE IT"
Aim high: Strive for perfection, and continually improve toward that goal. Customer satisfaction: Understand the customer’s needs, and do what it takes to meet them. Exceed expectations: Find a way to go the ‘extra mile’ to delight your customers. Control Solutions LLC has developed and implemented a Quality Management System in order to document the company’s best business practices, better satisfy the requirements and expectations of its customers and improve the overall management of the company. 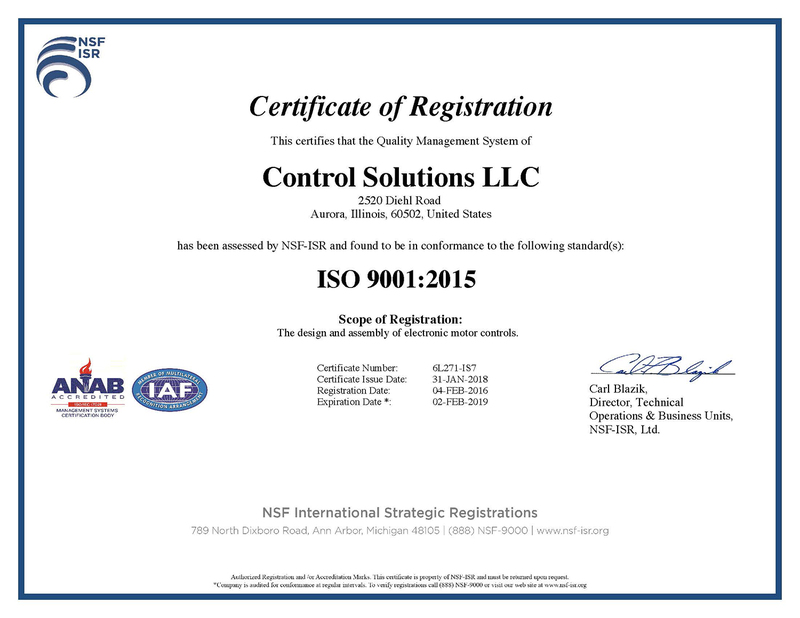 The Quality Management System at Control Solutions LLC is intended to meet the requirements of the international standard ISO 9001:2008. This system addresses the design, development, manufacturing, and servicing of the company’s products. This system is used internally to guide the company’s employees through internal processes and the various requirements of the ISO standard that must be met and maintained in order to ensure customer satisfaction, continuous improvement and provide the necessary instructions that create an empowered work force. This system is used externally to introduce the Quality Management System to our customers, partners and other external organizations or individuals. This familiarizes them with the controls that have been implemented by Control Solutions LLC to assure that the integrity of the Quality Management System is maintained, and focused on customer satisfaction and continuous improvement. Control Solutions LLC focuses on providing Supply Chain Excellence for all the customers and markets we serve. We track our performance across the entire supply chain against a defined set of metrics. The way we purchase raw materials has a major impact on our ability to give our customers consistent, quality products, on time and at competitive prices. Our Supplier improvement process measures ongoing performance and emphasizes ISO 9000 registration. The majority of our suppliers are either registered to this quality standard or well on their way to becoming registered.